Why can RFID do? How could your business make use of it? How Could RFID Features Help Your Business? The combination of features that RFID technology provides is unique. How could those features help your business? Applications are as various as manufacturing control, customer service management, inspection and compliance validation and logistics. Which features of RFID might mean most for your business? RFID tags give whatever they are attached to a unique identity, electronically stored and easily retrieved. Stock, plant and machinery, staff, IT devices, rooms, buildings, tools; any of them can have the means of being identified by computer systems. Systems can locate tagged items where they are physically, where they are in a process, when they aren’t where they ought to be, who worked on them last, and who checked them out or checked them in. By providing unique identities, RFID can contribute to a chain of accountability for a wide range of actions in business. RFID tags can store and identity and hold data which can be read electronically, without any human action if necessary. Tags can be read by readers at fixed points or can be read with portable readers or devices linked to portable computing devices. Data that identifies tagged items can be collected accurately and quickly. By careful design of systems; the time, date, location and person collecting the data can all be captured at the same time. By associating particular identity numbers with a database, information in computer systems can be linked with the objects in the real world. The connection between the tag and the reader writer device is over a short range wireless signal. Different types of tags can be read as little as 1cm from the reader while others can be as much as 10m away or even more. UHF tags can be read from further than other types. Data can be retrieved without the tag being seen (unlike bar-coding for example). Short range connectivity (1cm or less) can be used to force the identification of a particular tag at a particular spot. Longer range connectivity means data can be collected without the individual tagged item being physically located. Data can be collected when a tag passes a fixed location, for example. RFID tags can be found in underwater applications, in contaminated environments, in high-vibration areas or in areas where there is a risk of explosions. The adaptability of RFID tags means that they can be used almost anywhere. They can be used to provide identification rapidly in hazardous or demanding environments. One reader can collect data from a large number of tags at one time. Compare reading one barcoded item at a time from a shopping basket with being able to place that basket on a plinth and reading all of the items in less than a second, and without unpacking the basket. This feature makes possible mass data collection applications. These include such tasks as checking items on a pallet leaving a warehouse as it passes through the warehouse door or identifying everything in a cabinet for stock checking. Passive RFID tags (the most common) use the radio signal to induce their power, so they need no batteries or other power source. Tags can be made very small, making it possible for them to be attached to a wide range of devices, embedded in other devices or even to be injected into animals or humans. 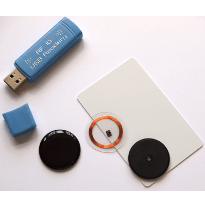 Without batteries, passive RFID tags have a very long life both before use and after being applied (even semi-passive tags which do have batteries can last up to 5 years). They can be used to track items over long periods of time. An appliance tagged to allow identification as part of a five year warranty scheme, for example, would have no tag life problems.